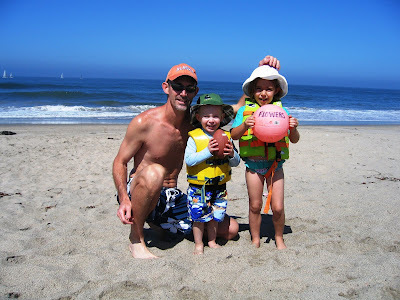 Jay thought it would be a good idea to take the family to the beach in Oxnard. The kids had never been to the beach here, and the weather was beautiful. So, we loaded up the car and took off. The kids were so excited, and although the water was pretty chilly, they ended up wet all over. What a great picture of Jay and the kids. Mason is so fair he looks like the cream between 2 vanilla cookies. 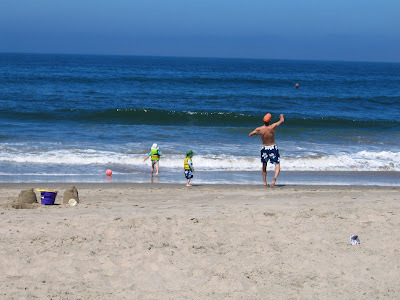 Most of the time, Jay would throw the football into the waves and the kids would wait for it to return and then retrieve it for him to throw again. They found this much more interesting than digging in the sand or building sandcastles. 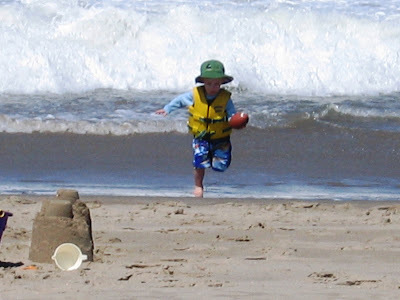 Here's Mason trying to run from a wave. 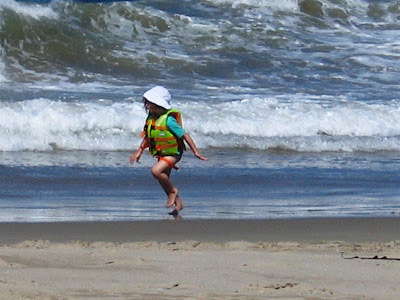 And Madeline ran and ran and ran up and down the beach. She just loved trying to beat the waves to the shoreline. Where's Mom? Well someone has to lay on the blanket and take the pictures! What a great family activity. Jay is so creative! The kiddos look so cute (you do also, Jay).